I'm all about supporting the new, the fresh, the upcoming. So when David A. Lindsay announced the publication of his newest 'Gaspar The Thief' story, I couldn't resist getting in contact with him. I've seen his name crop up around Goodreads, Twitter, and Facebook, and it's likely that you have, too. So, without further ado, I'd like to introduce the man behind it all! The back story to 'Gaspar The Thief' may be a little different to many other current e-book releases in that it was actually written in the 1980s, when I was in my twenties. I had previously succeeded in having a few short stories published in arts magazines in the mid to late 1970s, a couple of them commercially. Thereafter, I wrote 'Gaspar The Thief' in fits and starts, with long gaps in between, over a period of around ten years, but I never did anything with it, and did not make even one submission to a publisher. Looking back now, I think there were two reasons for this. Firstly, I got married, had three children, and was very busy as a young court lawyer building a career. Secondly, and this was perhaps the main obstacle, I think I was too much of a perfectionist. This all changed in early 2012 when my wife bought me a Kindle, and I realised that this offered a new opportunity to share what I had written. Fortunately I had taken steps over the years to preserve the original word-processed files. However, these had been created on an old Amstrad green-screen 8256 (does anyone else remember these?). Fortunately, I had at one point had the files transferred to floppy disks. I still had to buy an external floppy drive to access these, of course, but I was much relieved to discover that they were still intact. That's when I sat down to read what I had written almost thirty years ago. This meant that I was able to read 'Gaspar The Thief' almost totally afresh. I had actually forgotten large parts of it. And that's when I discovered that it was much better than I had thought when I wrote it. I am still a perfectionist, but I was very pleasantly surprised by the standard of writing. Moreover, I did not think it had dated at all. Nevertheless, I still revised it twice from beginning to end and re-wrote a few parts before publication. Another aspect that some may find interesting is that it was not influenced at all by Sir Terry Prachett's Discworld novels. A few reviews have commented favourably on similarities to Sir Terry Pratchett's work, but the truth is that I only started to read his books much later, in the 1990s, long after my book had been stored on disks and consigned to the attic. The floppy disks produced more than just 'Gaspar The Thief'. While examining them, I discovered long forgotten fragments of unfinished stories. One of these provided the plot and a good 10,000 words of 'Gaspar And The Fantastical Hats', which has now been completed and published as a prequel novella. I also found another lengthy fragment that will form the start of the next novel. 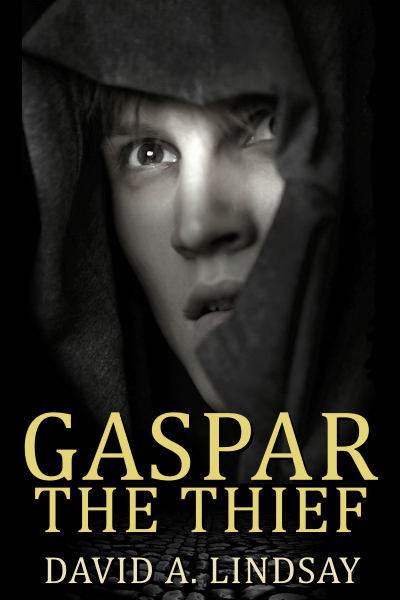 'Gaspar And The Thief' is available in paperback from Amazon. It is available as an e-book from Amazon, Apple, Barnes and Noble, Kobo, Smashwords, Sony Reader, and others. The prequel, 'Gaspar And The Fantastical Hats', is currently available only as an e-book from Amazon, but will be available for other e-readers in due course. However, it has been added to the current edition of the paperback. Finally, here's a little personal background. I was born and brought up in Dundee, Scotland, but have lived in North East Fife, near St Andrews, for nearly 30 years now. I am married with three children, all of whom have now left home. I was a lawyer for 20 years, but for the last 13 years have owned and run a web design business in the UK.